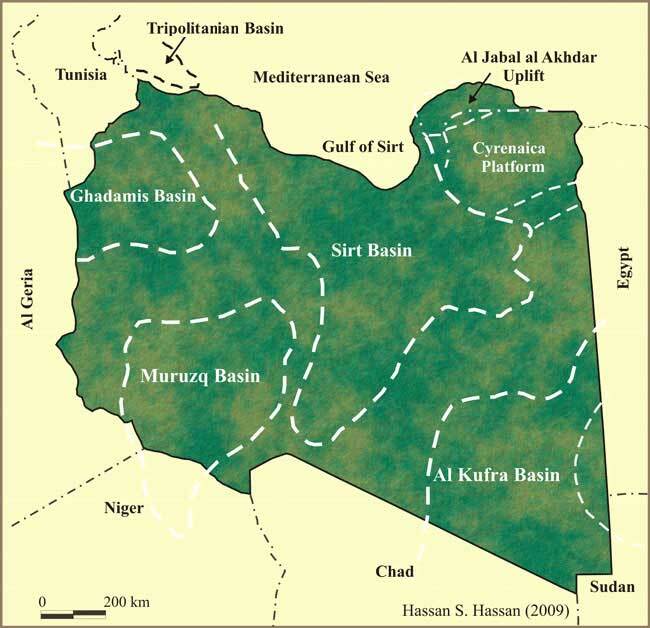 Location of major sedimentary basins of Libya with hydrocarbon potential. Click on hot spots on map to access pages with more information on these basins. Youngest of the Libyan Basins with largest petroleum reserves in Libya and ranked 13th of world's petroleum Basins. East-west cross section in central Sirt Basin showing the oil. The intracratonic Ghadamis Basin located on the western Libya, southern Tunisia and eastern Algeria. May have oil and gas sourced by Middle-Upper Devonian and Basal Silurian hot shales. Large intracratonic Paleozoic Basin, straddling the Boundaries of Algeria, Niger and Chad. The Basin is filled with sediment ranging in age between Cambrian to Quaternary, with maximum total thickness of more than 3000 meter in the central part. . The potential reservoirs in Muruzq Basin are mainly siliciclastics that include the Memouniat, Hawaz, Acacus and Tadrart Formations. The intracratonic sag of Al Kufrah Basin is oriented northeast-southwest and located in south eastern Libya, it is the third largest Libyan sedimentary Basin of about 400,000 km and has structural elements of varying ages and trends. No commercial discovery has been made to this date but hopes remain high and Libya has seen the entry of several American companies with an interest in the Al Kufrah Basin over the past two years. and source rocks. (Modified after Craig et al, 2006). North eastern Libya (referred to as Cyrenaica) is located on the southern margin of Mediterranean Sea and on the northern margin of the African plate. It is divided into two distinctive tectonic provinces. These are the stable Cyrenaica platform to the south and Al Jabal Al Akhdar uplift to the north. The upper Cretaceous and Tertiary rocks of Cyrenaica contain several potential reservoir and seal rocks. Contains the El Bouri oil field is the largest giant oil field discovered (1976) so far in the Mediterranean Sea in Lower Eocene Jdeir Formation. The trapping styles in the Basin are mainly stratigraphic buildup and minor faulted structures. Stratigraphic section of Offshore NW Libya. Sources: Hammuda, 1991, Sbeta (1990), and El-Ghoul (1991), Rusk (2001).